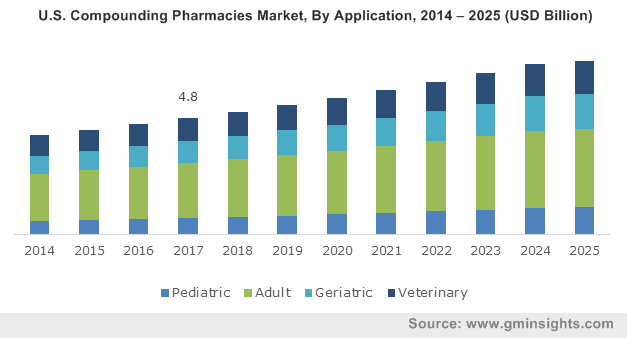 Growing demand for compounded medicine will serve to be a key factor that will drive the U.S. compounding pharmacies market growth. Convenience and benefits offered by compounding pharmacies such as ability to compound medications that are not produced commercially or formulate liquid doses for patient with difficulty in swallowing pills will increase the adoption of compounded drugs. Customized medication prepared by compounding pharmacies can thus provide better health outcomes for majority of patients, thereby augmenting the compounding pharmacies industry size. Furthermore, drug shortage in North America over past few years has affected the U.S. population. Increasing shortage of drugs for diseases such as cardiac disease, diabetes, cancer and other emergency drugs will surge the demand of compounded drugs. Timely unavailability of standard drugs due to production delay, discontinuation of previously manufactured drugs as well as limited capacity of facilities will further stimulate the compounding pharmacies business growth. Serious and fatal healthcare associated infections caused due to administration of contaminated compounded medication may render negative impact on the industry growth. Continuously changing regulatory specifications pertaining to compounding medication may further impede the regional business growth. 503A compounding pharmacy segment accounted for a considerable revenue share of USD 2.3 billion in 2017. The growth is attributable to the ability of 503A pharmacies to compound sterile and non-sterile medications in-house, as per the patient-specific needs based on the prescription. However, high cost involved in compounding as well as continuous changes in the regulatory scenario pertaining to 503A compounding pharmacies may limit the segmental growth in the foreseeable future. 503B compounding pharmacy segment is estimated to show lucrative CAGR of 7.2% during the forthcoming years. 503B pharmacies are outsourcing facilities that manufacture large batches with or without prescription that are sold to healthcare facilities for office use. 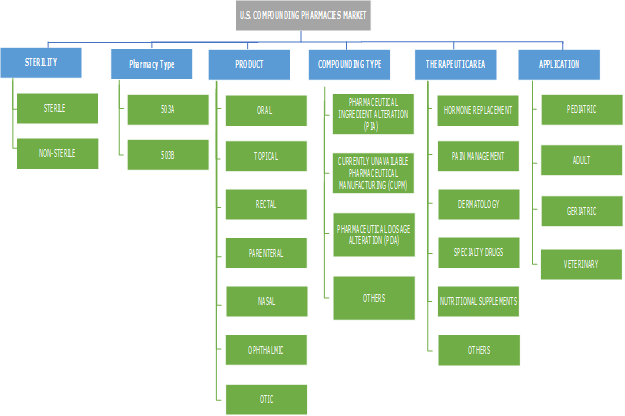 Large batch production of compounded drugs resulting in lower manufacturing costs will fuel the 503B compounding pharmacies market throughout the analysis period. Sterile segment is estimated to show robust CAGR of 5.2% during the forecast period owing to increasing adoption of compounded sterile medication in the critical care and operating room services. 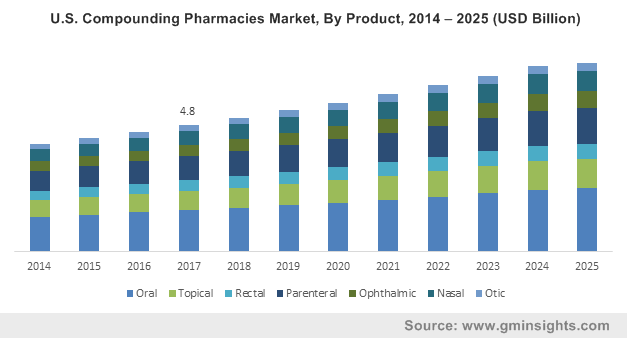 Growing adoption of injectables, inhalers and eye drops in treatment of various diseases will increase the demand for sterile compounding medications thereby driving the segment growth. Non-sterile segment held significant revenue share of 67.7% in 2017 and is projected to show similar trend during the forecast period. Inclination of patients towards oral medication such as tablets, capsules and syrups due to convenience of administration as well as availability of flavoured medication, especially for pediatric use will render positive impact on the segmental growth. Growing demand for compounded dermatology products will further support segment growth. Oral segment dominated the U.S. compounding pharmacies product segment with more than USD 1.4 billion revenue in 2017. The high market value is attributable to increasing demand for oral medication in the treatment of pain management. Furthermore, growing preference for liquid oral medication over other dosage forms due to associated convenience and ease of administration, especially among the pediatric and geriatric patient population will foster segmental growth. Parenteral product segment held significant revenue share in 2017 and is estimated to witness a considerable CAGR of 5.3% owing to benefits offered by parenteral medication including rapid onset of action and quick localized drug delivery. Moreover, growing demand for compounded parenteral nutrition (PN) such as two-in-one compounded PN, two premixed chamber PN and three premixed chamber PN will spur the market size over the forecast period. However, requirement of skilled persons for administration and stringent regulations may limit the segmental growth. Adult application segment held the highest share of 46.8% in 2017 and will show similar trend during the analysis period. Increasing prevalence of cancer, diabetes, cardiovascular and respiratory diseases among adult population owing to lifestyle changes, unhealthy dietary habits and other environmental factors will surge the segmental growth in the coming years. Geriatric application segment is estimated to witness robust CAGR of 6.0% over the forecast timeframe. Rapidly growing geriatric population base in the U.S. susceptible to various chronic disease will fuel the demand for customized medication tailored to specific needs. Ability of compounding pharmacies to combine certain prescriptions into single dose and formulate liquid doses for patients with difficulty in swallowing pills will further boost the market growth. Pharmaceutical ingredient alteration (PIA) segment accounted for USD 1.7 billion in 2017 and is estimated to show robust growth during the forthcoming years. Individuals allergic to a common preservative or additive require hypoallergenic versions of drugs that are commercially unavailable. This will increase the demand for drugs compounded by altering certain pharmaceutical ingredients thereby propelling the business growth. Currently unavailable pharmaceutical manufacturing (CUPM) segment is forecasted to witness significant CAGR of 5.9% over the analysis timeframe. Increasing shortage of drugs such as oncology and emergency medicines owing to quality and manufacturing issues will drive the segmental growth. Drug shortage leading to inadequate patient care, patient complaints and high institutional costs will increase dependence on compounding pharmacies. 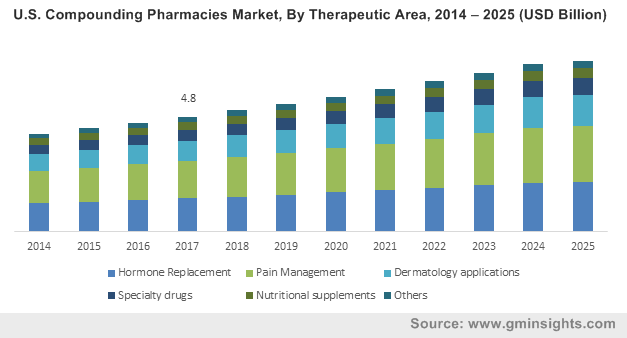 Pain management segment dominated the U.S. compounding pharmacies market with USD 1.6 billion revenue in 2017 due to growing demand for compounded medication in the treatment of pain management. Compounded drugs help to minimize dizziness, drowsiness, or stomach irritation caused by commercially available drugs used in arthritis, migraine and other such diseases. Moreover, formulating transdermal and topical gels or creams to deliver high drug concentrations at the site of delivery will further increase the adoption of compounded pain management drugs. Hormone replacement therapy segment will witness lucrative CAGR of 5.3% over the forecast period. Compounded hormonal therapy is formulated based on the level of hormones in individual patients that allows better management over commercially available standard drugs. Moreover, growing adoption of compounded bioidentical menopausal therapy among women population will augment segmental growth. Some of the leading industry players include Absolute Pharmacy, B. Braun Medical, Baxter, Cantrell Drug Company, Central Compounding Center, Clinigen Group, Dougherty’s Pharmacy, Fagron, Fresenius Kabi, ICU Medical, Institutional Pharmacy Solutions, Lorraine’s Pharmacy, McGuff Compounding Pharmacy Services, McKesson Corporation, Nephron Pharmaceuticals, Pencol Compounding Pharmacy, Pentec Health, PharMEDium, Premier Pharmacy Labs, Rx3 Compounding Pharmacy, RXQ Compounding Pharmacy, Triangle Compounding Pharmacies, Wedgewood Village Pharmacy and Wells Pharmacy Network. Industry players are primarily focusing on inorganic growth strategies such as acquisitions, partnerships and mergers to capitalize on market opportunities. For instance, in January 2015, Dougherty’s Pharmacy acquired McCrory's Pharmacy, a premier independent pharmacy that operated in retail as well as compounded prescriptions, with an aim to provide superior compounded pharmaceutical drugs and boost sales of the company. Almost all drugs were tailor-made or compounded by physicians or pharmacists for individual use, before the introduction of mass-produced pharmaceuticals in the 1940s. In 1997, compounding was brought into a federal regulatory framework by Congress, as a part of the FDA Modernization Act. Section 503A was added to the Federal Food, Drug, and Cosmetics Act. Under section 503A, compounded drugs were excluded from various FDA requirements, including production under FDA’s Current Good Manufacturing Practices, label with adequate directions for use as well as FDA's Approved New Drug Application. In order to prohibit large-scale compounders from acting as traditional drug manufacturers, section 503A dissuaded compounders from promoting, advertising and soliciting prescriptions. However, compounded drug crisis at the New England Compounding Center in 2012, provided Congress fixed FDA's enforcement authority to strengthen communications between state health officials and federal authorities. In November 2013, Congress passed the Compounding Quality Act, to fill the gaps in FDA inspection and enforcement of compounding pharmacies. A voluntary category named outsourcing facilities was created under 503B, a new section of the Federal Food, Drug, and Cosmetics (FD&C) Act. The new category aimed at bringing large compounding manufacturers under the federal regulatory and enforcement fold. Recently, only few pharmacies in the U.S. offer in-house compounding alone due to high compounding costs and strict FDA regulations.